The added grip allows for ease of disconnection from the circuit. The integrated swivel connector with grip allows for easy disconnection and helps prevent entanglement. Wider tube design allows for flow rates up to 60 L/min without increasing resistance for more reliable delivery of therapy. MRI-Compatible Contoured Prongs Soft and anatomically formed nasal prongs conform to the individual patient to provide maximum comfort. Fits to most heated wire breathing circuits. Wider tube allows for higher flows (up to 60 L/min) without increasing resistance. Reduced risk of kinking and the tubing does not produce a rustling noise, allowing the patient undisrupted rest. The wide elastic split-strap is easy to adjust and provides a more secure fit and increased patient comfort. Adult nebulizer convenience kit for Aerogen® Solo designed for use in USA. Pediatric nebulizer convenience kit for Aerogen® Solo designed for use in USA. 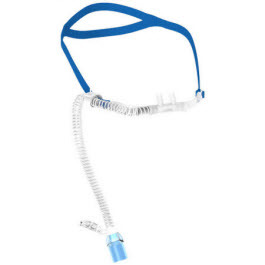 Veoflo® Tracheostomy Interface - FLEXICARE, INC.
Veoflo® tracheostomy interface is ideal for spontaneously breathing patients weaning from ventilation and requiring high O2.